Youth Commission for Human Rights-Centre for Research and Training (YCHR-CRT) Chief Executive Officer Shazia Khan has said that the multi grade teaching techniques would help improve literacy in Pakistan. 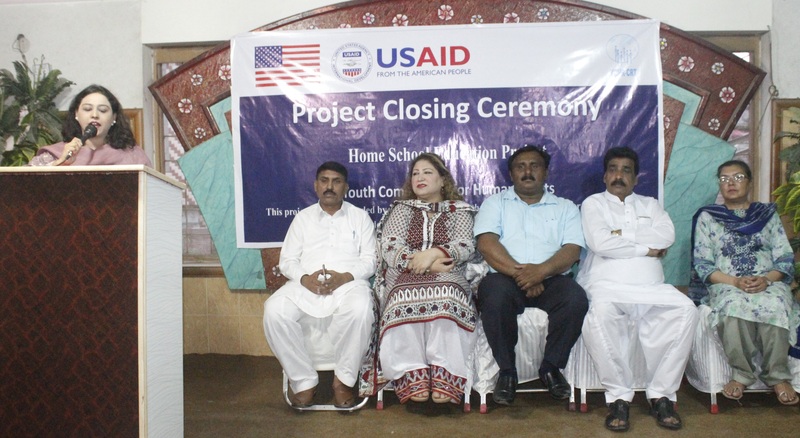 She was addressing the closing ceremony of the home school project, implemented by YCHR-CRT in Lahore and Muzaffargarh and supported by the USAID Small Grants and Ambassador’s Fund Program, here in the Band Road area. Highlighting the project details, Shazia said that they initiated the home school education project from March 2016 as a multi-grade learning approach and designed to address the needs of out of schoolchildren in the underdeveloped two selected districts. Under the umbrella of the home school project, YCHR has established 20 home schools – five in Lahore and 15 in Muzaffargarh, aimed to provide education opportunities to 600 out of school children of age between 5-14 years through non-formal home schools and ensure continuity of their education. As many as 20 potential teachers through social mobilisation campaign were identified, one for each homeschool. The Directorate of Basic Education Community Schools (BECS) was also engaged to provide trainer as a consultant, having demonstrated relevant experience to conduct training of teachers. After an extensive training, the home school teachers with their devotion and door-to-door mobilisation have enrolled 1128 students (437 boys & 691 girls). For mainstreaming of the students, 686 students (265 boys & 421 girls) have been enrolled in formal schools. Keeping in mind the importance of girl’s education, the homeschool teachers also enrolled about 200 adolescent girls in their home schools. To make the effective functioning and monitoring of home schools, a 10-member School Management Committee (SMC) have formed for each homeschool. Member of Punjab Assembly (MPA) Saadia Sohail Rana congratulated the organisation for the initiative and said that Muzaffargarh was one of the least developed districts of Punjab and extending a helping hand to assist the national efforts to increase literacy was commendable. She said the government would make efforts to sustain such interventions.